Going slowly. I am out of town today but will be working to get the head off this weekend. With everything else having failed, I will be trying the trick of filling a cylinder with rope at BDC and manually rotating the engine with the hopes that it will push the head off. Wish me luck! Is the head attached with studs or bolts? 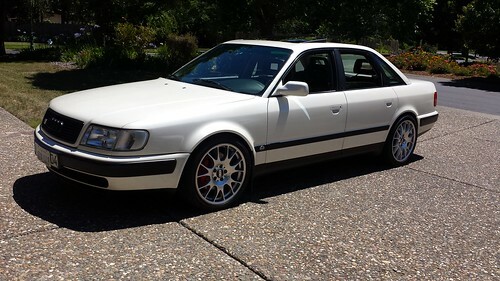 Years ago I had a Saab 99 that had a Triumph engine that was notorious for head problems. It was an alloy head attached with studs, and there would be galvanic corrosion between the studs and the head that made them incredibly hard to get off. The usual idea with an older car was to use hammer & chisels to raise the head up enough to get a hacksaw blade in and cut off the studs, and the head was sometimes destroyed in the process. This happened to me on a 10vt with ARP head studs before they had the allen broach on top, and were undercut. Had to rig up a jack to push the head up. If you can remove them, I'd definitely do that first. The head may have also mushroomed around the threads. That's pretty common too. Man, I guess they get their reputation for a reason. Drop a 2.7T in it! I made some progress this weekend. I still can't get the damn head off though. I believe I now know why though. When I bought the car there was a ton of coolant that had seeped out into the intake manifold plenum and also pooled around the intake. 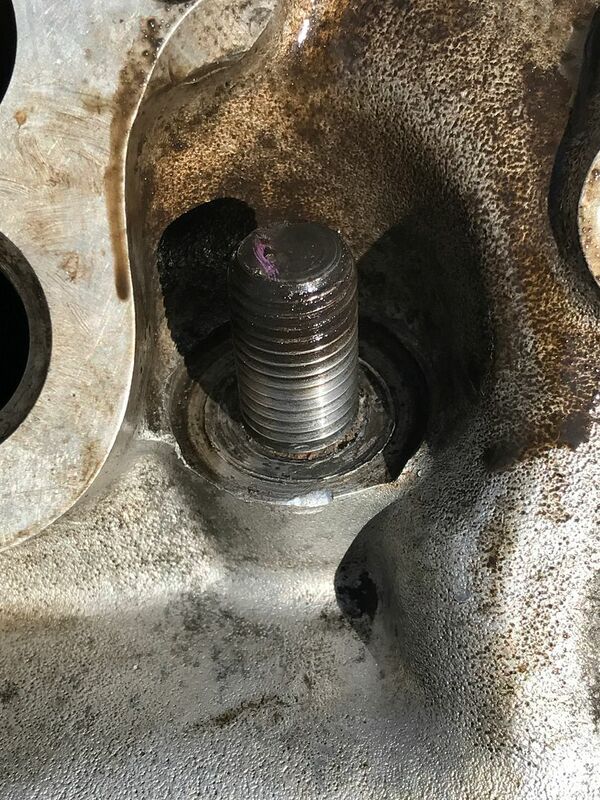 As a result, the two inside head bolts both were sitting in a coolant pool for quite some time. I believe there is some corrosion that has glued the head bolts to the head. You can see the funk surrounding the bolt. I now need to figure out how to break that seal. Also the engine is now out of the car and power washed. Grillage wrote: I made some progress this weekend. 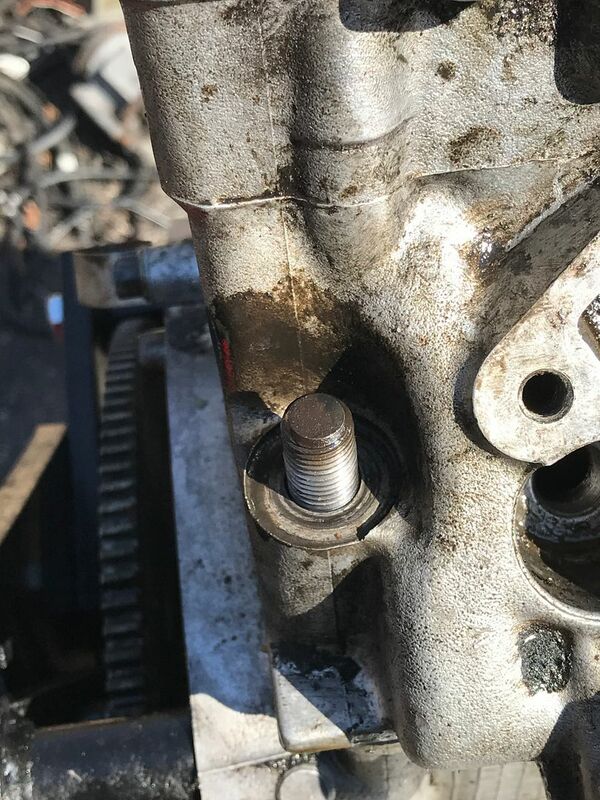 Glad to here that the crank bolt is out. Assuming they are studs is there room to double nut turn it out? 30 some years ago I helped my father pull the aluminum heads off his '37 Lincoln zephyr, not using distilled water had caused the head to corrode around the studs. We pried the heads off with crow bars and screw drivers. It was mess, fortunately after welding up the holes and machining the heads there where saved. Hoping you find a path to success. X2 on double-nutting the stud and trying to pull it. It may be so far gone that the stud is seized in there and you will not be able to get it out, but it's certainly worth a shot. Yeah, if all else fails I'm thinking weld nuts on the studs for removal. I've tried the double nut trick and I can't get them tight enough to each other to move the stud. They're really in there! I'd love to find a FI version though. Great project and not for the fainy hearted. nut on to the studs will help too. Weld nuts on the studs with high amperage, the heat end electrocution may help! 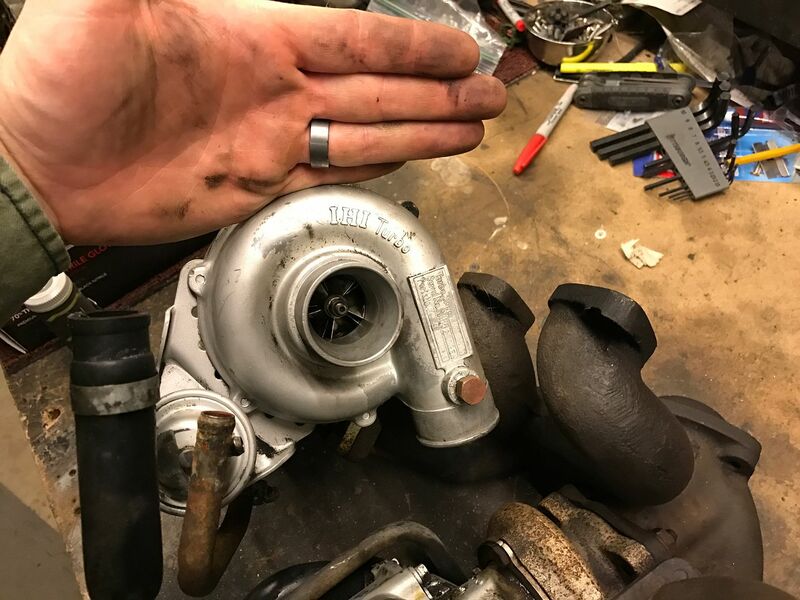 Look at the itty bitty turbos! Man- you are getting deep in this thing. I guess there really is no such thing as a cheap Maserati! Ok to keep from cluttering your other project thread. What a nice unique car that you picked up. 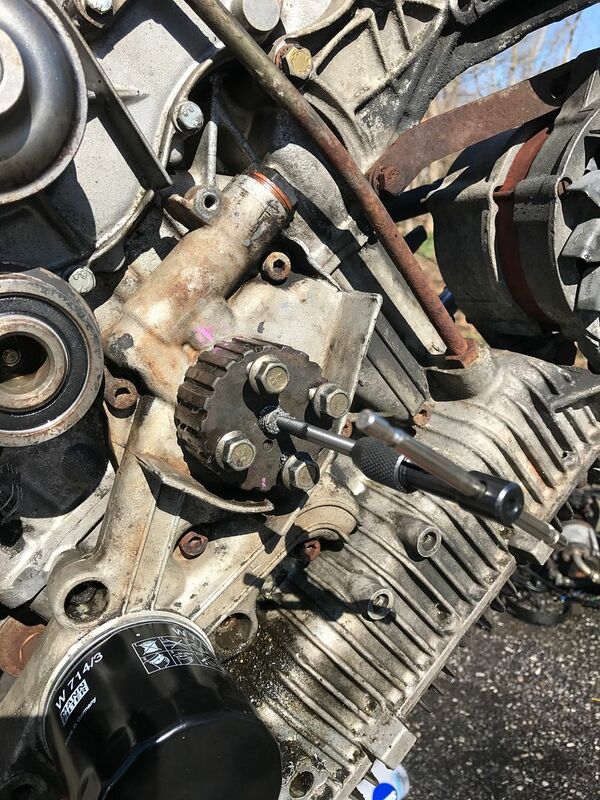 Bummer about the engine. 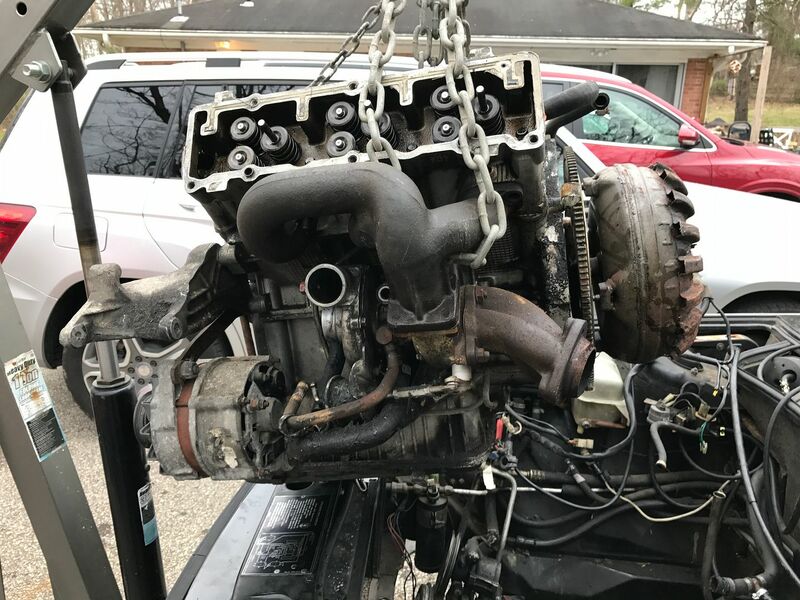 Nice score on a replacement engine! Curious where did they put those little turbos on this engine? 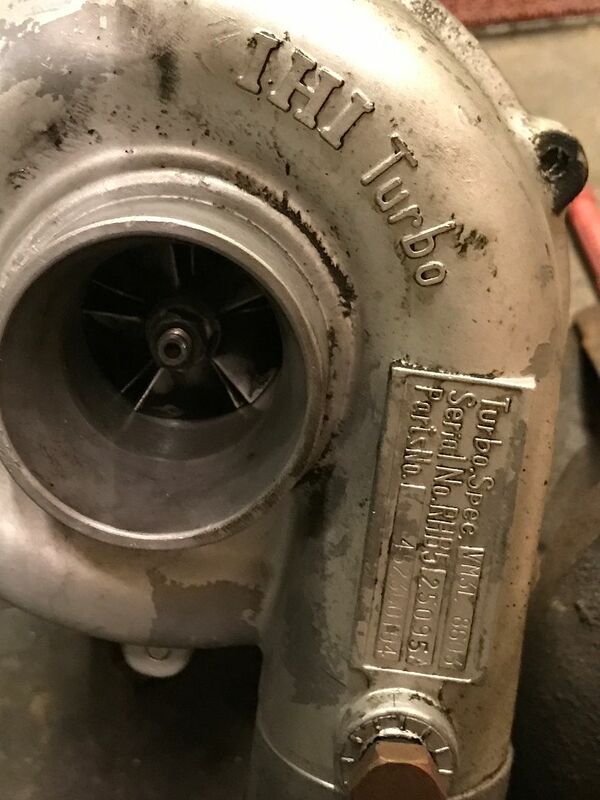 Looking at the pic in your other thread of the engine you picked up I didn't see any turbos on it. 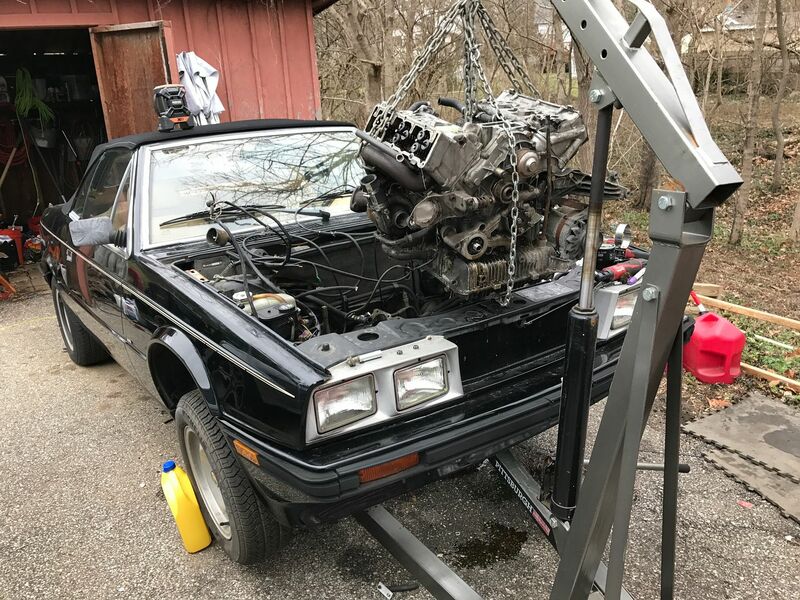 To update everyone else, I am giving up on the first engine. The machine shop couldn't get it apart either and short of destroying it, I can't figure how to get it apart. 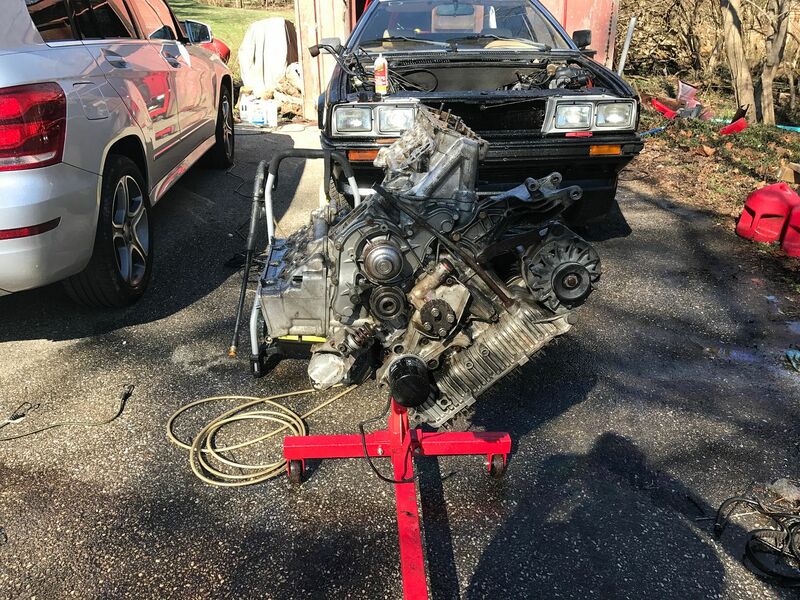 So I found an '85 engine on ebay about 3 hours SE of me and picked it up last weekend. 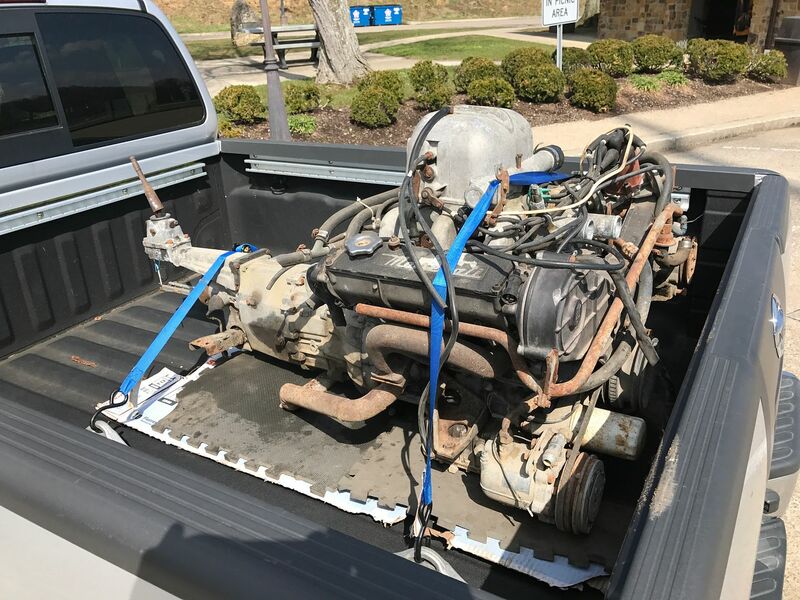 It came with a 5 speed trans that I won't need so I hope to sell that to make up some of the $ I'm spending. This one had been converted into a single turbo engine and as such I have a few things to fix. The oil port and intake port on the one side (pictured above) have been blocked off with welded aluminum. Hopefully I just need to drill through the aluminum and I'll be good to go.